Bloodstains on the sofa, a laptopo bag inside the condo unit which is believed to be being rented by Deniece Cornejo. It was where Vhong Navarro was mauled by 8 ofthem on January 22, 2014. 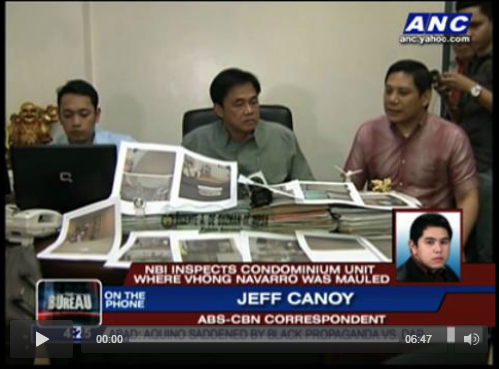 The NBI found nothing except these things that is contrary to what Cedric Lee is claiming of. The agents entered the condo to see if the things that Cedric have said have evidences but to no avail. Soledad Ramos (unit owner) and Greg Binunus (Malaysian renting the unit) accompanied the investigators inside to condominium to find clues for the said case. Since the date of the mauling, this is the very first time that the National Bureau of Investigation is going to enter the condo unit to investigate. Vicente de Guzman, NBI Assistant Regional Director said that there was a blood stain at the sofa but they could not get a sample because they don’t have a forensic expert with them during that time. Because of this, they will have it examined by their own forensic examiner. We remember that Cedric Lee stated during his interview on ABS-CBN that there was damage inside the condo unit that Navarro has to pay because of the fight between them and Deniece. We will be informed one of these days with regards to the result of the investigation. Be updated on this case in our future post here.